Rarely, a game comes along that revolutionizes design and inspires a new generation of play. Donkey Kong evolves into Super Mario Bros. Bejeweled inspires Candy Crush Saga. Undoubtedly, one of the biggest revolutions in games in the last decade has been Minecraft. Minecraft ushered in a creative renaissance in gaming, allowing players to build and craft their own completely-from-scratch world while adventuring. It’s been a cultural phenomenon, with merchandise, conventions, and an upcoming movie. 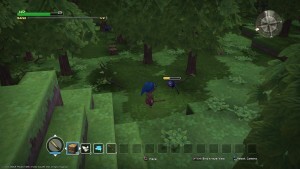 Now Square Enix’s Dragon Quest Builders looks to evolve the building genre that Minecraft pioneered by blending it with RPG (role-playing game) elements and a driving story. In Dragon Quest Builders (DQB), your child, as the player, is charged with restoring a world where the ability to build and create has been stolen by the king of monsters—the Dragonlord. Your child is the only one who can still build new towns, recruit villagers to help, and defend their base from an ever-growing horde of monsters. While the overarching story is a fairly standard Fantasy Bad Guy is Bad and Needs Swording plot, the writing has a lot of personality and charm. It leads to standout moments; for example, one villager decides to trust a new person based solely on his beard. Another character got buried alive and didn’t realize he could simply dig his way out. The events of the story are never flat-out funny, but it always made me smile when my character would fall asleep as the Goddess of the world drones on about my destiny. Gameplay in DQB revolves around building up your town and completing quests for your villagers. Your child will always have a task and a goal, instead of having to find their own fun like they do in Minecraft. DQB has an engaging blend of action and creativity. In the action portions of the game, your child goes out to find materials and fight monsters, like in Minecraft. In DQB however, they can also complete quests and find new characters or story locations. The game plays from a third-person perspective, so for example, if your child is in a fight, they can easily determine where they need to dodge or when they need to move in for the final strike. This perspective is reminiscent of games like The Legend of Zelda, and it gives the player a stronger sense of who they are in the world. While it’s not as full-featured as Minecraft's Combat Update, Dragon Quest Builders is fun and simple. Your child can also build traps, turrets, and other defenses to help them in combat. The creation side of gameplay gives players the freedom to build as they wish, like in Minecraft, but backs it up with a strategic layer. The buildings in your child’s town will give them specific buffs (temporary advantages) and abilities. For instance, if your child builds bedrooms for their villagers, they’ll have more HP (health points) when monsters attack. Build an armory and villagers will run and grab swords when Slimes come crashing at the gates. Your child can even build areas for their villagers to start crafting things; build a barbecue and the villagers will grill up tasty treats while your child explores. Dragon Quest Builders also has some common sense additions for the burgeoning Minecraft-style genre, giving your child a chest that automatically stores loot (so they’ll run into “Your inventory is full” problems far less often). Plus, your child will build recipes from a list, which means no more needing to figure out where to place things in their crafting station (like you have to do in Minecraft). Building from a list does take away a little of Minecraft’s open nature since in DBQ you need to earn the recipe instead of just making it yourself. However, it also lets DQB give new recipes as rewards, so there’s more sense of accomplishment. In DBQ, the crafting gameplay also feeds into the action gameplay. Your child will gain recipes for new armor and weapons, enabling them to survive deeper out in the wilds. They’ll need to craft healing potions, and buff items, food, and other consumables to help fight off monsters. Do well in the action and they’ll have more options for building, giving them a better chance in combat. Don’t think that the Dragonlord’s going to let your child get away with building a town! As the game progresses, your child will be faced with battles where the monsters assault their settlement; the monsters will even try to knock down buildings. I had one attack where big, mallet-wielding baddies broke through my defenses and got into my residential district, bashing bedrooms into dust. After that one, I spent some time reinforcing my city walls. To me, the monster attacks in DQB had a stronger personal impact than random Creepers showing up at my door in Minecraft. The ties to the story, and the fact that the monsters were attacking cool side characters with personality, had me way more interested in defending against said attacks. These systems create a game with greater design focus and depth, but less freedom than Minecraft. DQB uses a lot of the classic design aspects that iD Tech teaches at camp—like a stronger demonstration of risk vs reward, telling a story using the Hero’s Journey, and Player Directions—that aren’t utilized in normal Minecraft. However, since players are constantly given specific quests to complete, they lose some of the ability to blaze their own path and decide where they’re going to spend their time. While losing that freedom does mean DQB isn’t as replayable as Minecraft, there’s still a lot of content in the game. Each of the four story chapters has a list of special challenges that unlock once you beat the chapter, plus there’s a battle arena and an unlockable creative mode. The creative mode lets you build to your heart’s content, and lets you upload your creations to other players and look at their buildings. Unfortunately, there’s no real multiplayer to DQB, which is one of Minecraft’s strengths. Dragon Quest Builders evolves the Minecraft formula by adding more fundamental game design principles and creating a very directed experience. If your child is looking to learn more about game design and loves Minecraft, they could learn a lot by spending some time with DQB. As they play, encourage them to pay attention to how the game draws them to new places with rewards and visual clues (and how to give clues to hidden objects). They’ll see how to slowly grow difficulty over time, as the monsters become more frequent and get special attacks. Your child can also learn how nonplayable characters and story can grab a player’s attention and keep it. DQB is a great game to introduce people to the building genre of gaming, since it blends the directed experience with creativity really well. The tighter focus of Dragon Quest Builders is what makes the game really stand out. Blending player creativity with charming characters and simple but fun combat kept me interested in seeing where the game was going to go next; I wanted to dig down to find new items, and wondered how I could keep improving my town for longer than when I played Minecraft. Dragon Quest Builders is a fantastic example of a revolutionary game inspiring its own exciting evolution of design. It’s built upon the foundation of Minecraft and adds its own blend of story and character. So if your kid loves Minecraft, challenge them to start the next unique age of game design with the lessons from DQB. If you’re still shopping for the holidays, this game could be the perfect gift! Dragon Quest Builders is rated E10+ by the ESRB and is available on PlayStation 4 and PSVita. Review based on the PS4 version of the game. Header image courtesy of Gamevicio.